This video shows the a mock-up title screen. 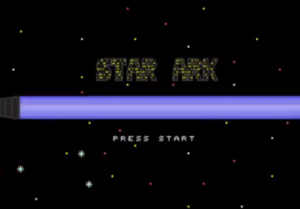 The ship in Star Ark is a Bussard ramjet and this title screen depicts the vessel traveling in the interstellar void from right to left. The flickering trail of plasma exhaust from the fusion engine acts as underlining for the title.